HAUNTED? 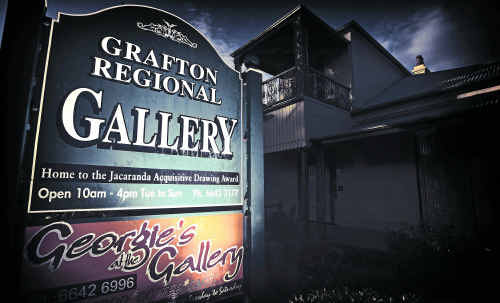 : A recent paranormal investigation of the Grafton Regional Gallery turned-up some interesting results. ALONG with a beautiful, heritage-listed location and a renowned collection of artworks, it seems Grafton Regional Gallery can now boast another drawcard – its very own resident ghost. Members of the Queensland Paranormal Research and Analysis Group (QPRAG) recently conducted a night time paranormal investigation at the gallery's historic Prentice House in Fitzroy St based on reports from visitors and volunteers of ghostly occurrences there over the years. After going over hours of data collected on the night from video cameras, digital voice recorders and electromagnetic field (EMF) meters, the results are in and the team believe they have found strong evidence of paranormal activity. “Our conclusion is the gallery is rated a Category: 2 (Paranormal Activity captured but no visual evidence),” said Chris, one of the investigation team leaders. 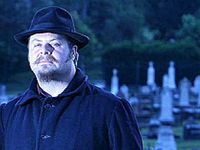 This means the data gathered by the group ticked many of the boxes indicating paranormal activity, except for the holy grail of ghost-hunting – capturing an apparition on video or camera. However, what the team did get were several digital sound recordings containing what they believe is Electronic Voice Phenomenon (EVP), which is unexplained recorded sounds or voices. The team sent these recordings to The Daily Examiner. One of the recordings contains a male-sounding voice clearly and commandingly saying “go!”, while another contains what also sounds like a male voice saying something unintelligible. These recordings turned-up on digital sound recorders placed near the gallery's staircase, which became a focal point of the overall investigation. The team has ruled-out these voices coming from its own members, with the recordings being made either during a lock-out period on the night when the entire team was waiting outside the gallery, or in the case of one recording, during a period where two members were inside, but sitting in complete silence. Along with the voices, Chris said several unexplained bangs and scrapes were recorded; irregular EMF activity (which is believed by ghost-hunters to indicate paranormal activity) was noted, and; two video cameras positioned inside the gallery were inexplicably turned off while recording, despite having plenty of battery power left. The power switch on one of these cameras was actually found to have been physically turned to the “off” position, but no one was anywhere near the camera at the time. Chris said a combination of these incidents, and others, led the team to the conclusion there was indeed paranormal activity at the gallery. She also said the gallery investigation had proven to be one of the team's most eventful. “Now that we've reviewed all the data, I think it's probably one of the best ones; it's the most we've ever picked-up in one night,” she said. 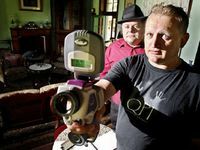 Chris said the South-East Queensland-based QPRAG team was keen to return to Grafton soon and had its sights set on historic Schaeffer House, which is said to boast a ghostly tale or two of its own. To celebrate the QPRAG team's findings, youngsters will soon get a chance to do some ghost-hunting of their own at the gallery, with day-time children's ghost tours to be held during the April school holidays. The tours will be a fun, supernatural-themed exploration of the gallery and its history and kids will also be treated to a free ice cream at the end courtesy of I Scream. Open to children aged between six and ten, the tours will be held from 11am on Saturday, April 9 and Wednesday, April 13. The group numbers for the tours are strictly limited so bookings are essential – for more information or to make a booking, contact the Grafton Regional Gallery on 66423177. This poll ended on 23 May 2012.